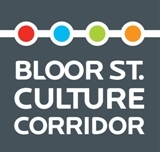 In conjunction with Diligence and Elegance: The Nature of Japanese Textiles exhibition at the Textile Museum of Canada. 1) TheYūzen Silk, The Dyeing Art of Kakoh MORIGUCHI 30 min. The traditional died art of Yūzen has adorned kimono since the late seventh century. MORIGUCHI Kakō (1909-2008) rose from rigorous apprenticeship to become a modern master of Kyoto yūzen and in 1967 was designated Holder of an Important Intangible Cultural Property: Yūzen, a title more popularly known as Living National Treasure. Over a long career he reconciled the twin themes of heritage and innovation, bringing creative passion to highly inventive works of modern sensibility. The film illuminates his artistic world by following him at work in 1988. 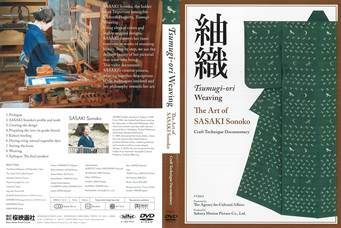 SASAKI Sonoko is the Holder of an Important Intangible Cultural Property: Tsumugi Weaving. Using elegant colours and highly original designs, SASAKI conveys her inner emotions in works of stunning beauty. Step by step, we see the delicate beauty of her pictorial ikat come into being. This video documents SASAKI’s creative process, weaving together descriptions of the techniques involved and her philosophy towards her art. 1) Saga-Nishiki Weaving: The Art of KOGA Fumi 30 min. A warp of tategami, washi paper cut into thin strips. A weft of silk yokoito yarns. Togather they vreate the patterns of Saga-nishiki brocade fabric. KOGA Fumi inherited the traditional Saga-nishiki weaving techniques fo her hreat-grandmother and employed them to create artistic masterpieces inspired by her impressions of nature scenes. KOGA brought Saga-nishiki, a craft wih origins in the late Edo period, to new heights of artistic creation. This video documents the production of materials used in Saga-nishiki weaving and KOGA’s creative process, focusing on the key steps of doing her own dyeing, setting the tategami on the loom with proper tension, and weaving twill, introducing several examples of her beautiful work along the way. Kyūshutsu lacquer artist MASUMURA Kiichirō was named the Holder of an Important Intangible Cultural Property: Kyūshutsu a title more popularly known as Living National Treasure, in 2008. His art brings the beauty of form alive, shaping a vriety of materials from leather to hemp cord to kanshitsu (lacquered layers of paper and cloth) into works of free-ranging creativity. Here we introduce some of his craft through two new pieces, a knshitsu plate and a lacquered leather box. 1) Miyako Jōfu 41 min. YAMAMOTO Akira, recognized in 2014 as the holder of the Important Intangible Cultural Property of chōkin metal chasing, uses two main techniques in his coloured metal works – kiribame-zōgan and hagiawase. Kiribame-zōgan involves cutting out decorative motifs in coloured metals and inlaying them into a chased metal sheet, which is then brazed. In hagiawase, metal sheets are cut into various shapes then brazed together to form three-dimensional vessels, etc. YAMAMOTO’s works usually feature wildlife and seasonal landscapes, portrayed in a unique style that’s both delicate and gorgeous. This video shows the process of making a hagiawase box with a cutout inlay design called “Rippling River”. 1) The Art of Bamboo, Shōkansai Iizuka 30 min. 2) Kyūshitsu: The Art of KOMORI Kunie 37 min. Kyūshitsu simply means to apply lacquer, but to KOMORI Kunie, it refers to the overall process involved in giving life to the exquisitely lacquered forms that he envisages. Each step, from the creation of the substrate to the application of the shitaji and the uwanuri final coating, requires the utmost skill and precision. It’s time-consuming process, but the result is a work of art that reflects KOMORI’s refined sensibilities and innovative spirit. This video, recorded at KOMORI’s studio in the city of Wajima, Ishikawa Prefecture, documents the art and dedication with which he pursues his creative vision. The Mizushima Family from Meiji to Taishō and Shōwa Eras 24 min. くらしを衣裳で残す　水島家の明治・大正・昭和 1989/Revised 2010Through items of clothing, traditional dolls, and other personal possessions left by five generations of women of the Mizushima family, this DVD illustrates the culture of daily life and continuing traditions in Japan during the period covered by the Meiji, Taishō, and Shōwa Eras (roughly, the late 19th to the late 20th century). HARA Kiyoshi was born in 1936 in Shimane Prefecture. In 1954, he went to Kyoto and was accepted as a live-in apprentice to Ishiguro Munemaro. Later, he began to study seriously with Shimizu Uichi. In 1965, he set up his own kiln in Setagaya, Tokyo where he experimented with various techniques and means of expression, especially with iron glazes, becoming a highly skilled ceramic artist of traditional iron glaze pottery. 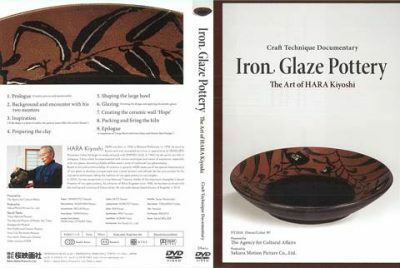 Based on his profound knowledge of ceramics in general, HARA made use of the special characteristics of iron glaze to develop a unique style that is both dynamic and refined. He has won acclaim for his innovative techniques, taking the tradition of iron glaze pottery to new heights. In 2005, he was recognized as a Living National Treasure, holder of the Important Intangible Cultural Property of iron glaze pottery. As a director of Nihon Kogeikai since 1996, he has been involved with the training and nurturing of future artists. He was made deputy board director of Kogeikai in 2010.